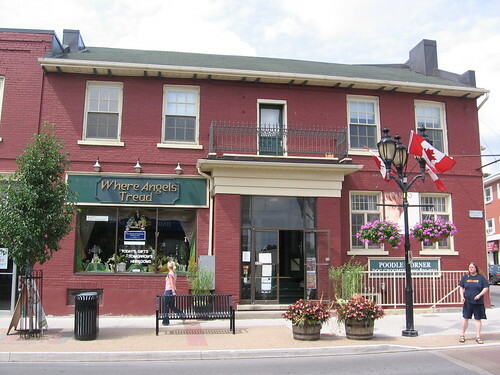 Former home of the Comic Wizard, Newmarket, Ontario, originally uploaded by BigAssSuperBlog. King George Hotel 232 main St. S.
King George Hotel, circa 1845, was established by James Forsyth as the Forsythe House on the site of an earlier hotel owned by fur traders Roe & Borland. The original location Comic Wizard was downstairs where you see the Poodle Corner, in a dark, cramped basement location (bottom right). Eventually the Wiz moved up to the main retail space in the former King George Hotel -- now Where Angels Tread, but after the Comic Wizard closed, it was a lingerie shop. I sold my whole Star Wars to collection to the Comic Wizard in his basement dungeon in about 1984 in order to buy the steering wheel accessory for the ColecoVision -- Expansion Module #2 with Turbo -- from Sears. Stupid move. I nostalgically remember the Comic Wizard - both the store and the Wiz who ran it. Back in the day, I think I actually believed he was a wizard, or maybe it was just too much D&D influence. Remember all the paintable fantasy figurines he had? Loved that place. I remember going into the store for the first time in 1984 and seeing used starwars figures in baggies on a spinner rack....there was a tuscan raider with cape....my mom refused to let me buy it! She didn't want me to "start collecting that stuff again!". One year later I started collecting comics and now I have so many I'm a local dealer!....and I eventually did start collecting starwars figures again of course!